It was the first evening on our first ever visit to the town of Broken Hill while on a driving holiday. Having had a good evening meal, we felt very satisfied after settling into our cabin. It was not too warm outside, and we thought we’d do a walk from the caravan park along the main road outside. It was dusk, but there seemed to be enough time before dark, to get at least half an hour's exercise. The road was the Barrier Highway heading towards South Australia, which we'd be taking a few days later on our journey homewards. Typical of rural Australia the road was shaded by Eucalyptus trees and we walked under them as we stepped out of the gateway and turned right. While walking we realised that conversing was made difficult due to bird cries that were quite strident and loud. 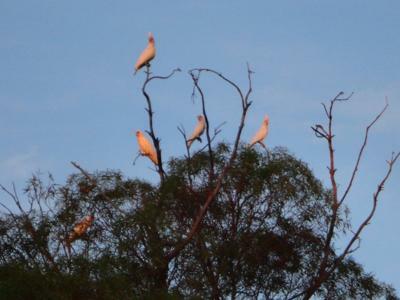 It seemed to be mostly cockatoos making the noise, with some crows also joining in. 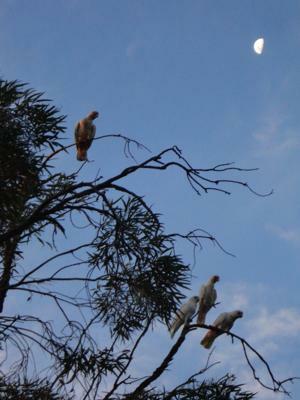 There were small groups of cockatoos 'flying in formation' and flying low. Soon it became apparent what the commotion was about. One of their number was lying dead on the road. It must have been flying low when hit by a passing vehicle. Seeing the cemetery lying beyond as we walked in the gathering gloom, reminded us of the mortality of all life. The resulting pensive mood, amidst the shrill calls of the birds brought the opening line of Gray's Elegy to my mind. The curfew tolls the knell of parting day…. 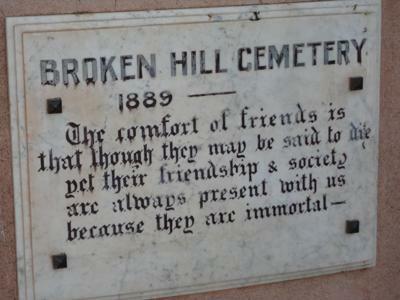 Other lines would come to mind when we spent time in Broken Hill, and saw its sights and visited a few of its museums. We walked in the direction of Adelaide for about 15 minutes and turned back after reaching the edge of town. The sun was low in the sky and the birds were gathered in the trees. 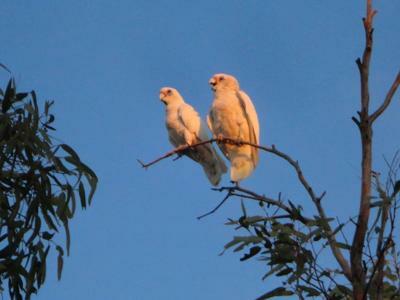 As we got closer to where the dead bird lay, we realised that the trees in the area were full of cockatoos. The sounds they were making was not just noise, but sounded more like mournful songs! Looking around and above, we realised it was a definite gathering, a 'wake' or send off to their fallen mate that was taking place in the trees. We paused to take in the sight and sounds. Who would think that a fallen bird among a large flock would elicit such a communal response from those left behind? The sounds we were hearing could definitely mirror the funeral hymns that would have been sung when those lying in the adjacent cemetery were laid in the ground. It seemed quite extraordinary to witness and hear this, since we were not familiar with bird life and behaviour. As we walked back to our cabin for the night, a deeper awareness of creatures that we share this planet with occupied our minds and discussion. They too must make relationships.... friendships... that last, and leave an imprint longer than we imagine.